Before he was President, Abraham Lincoln was a lawyer, and he wrote this little-known essay with his advice on law practice, from avoiding litigation to practicing extemporaneous speaking. Above all, is integrity. “[R]esolve to be honest at all events; and if in your own judgment you cannot be an honest lawyer, resolve to be honest without being a lawyer.” Former judge Frank Ceresi provides commentary and the book includes a thoughtful introduction by Professor Brian Dirck, the foremost expert on Lincoln’s career as a lawyer. 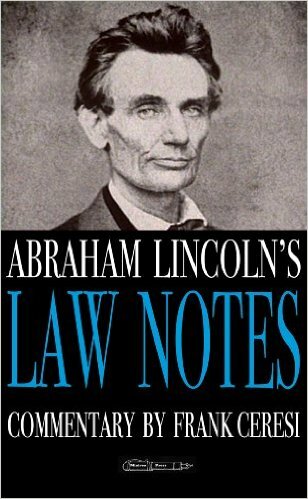 Abraham Lincoln’s Law Notes is available on Kindle for 99 cents and a pdf of Lincoln’s handwritten manuscript is free to anyone who buys it.